This is a bulk lot of 30 plants. Rhoeo is a short-stemmed tender foliage plant which makes attractive small, dense, clumping rosettes. It forms a solid groundcover of upright purple and green leaves. The 15cm to 20cm long, sword-shaped leaves are green above and purplish below. The unusual flowers, borne down among the leaves, appear as clusters of tiny white flowers nestled within two boatshaped, purplish bracts. They are not noticeable unless you look closely. Also commonly known as Moses in the bulrushes, Moses in the boat. Various scientific names too: Tradescantia spathacea, Rhoeo bermudensis, R. spathacea nana. 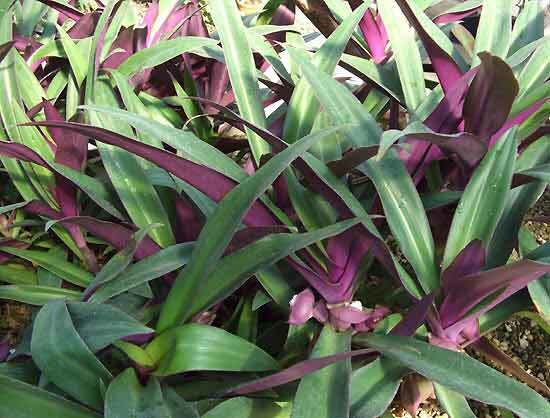 Rhoeo is ideal for use as a quick-growing groundcover, thriving in full sun to part shade. Also can be used in pots indoors. Treat as a succulent. Well-drained soils are a necessity. It is extremely drought-tolerant, even growing in cracks in a concrete wall. Plant and forget. Also a great tough indoor plant. Protect from frost. Plant a little deeper than originally to encourage more root growth. Fungus, root rot, and leaf spot can all be problems for Rhoeos if plants receive irrigation.